If you're going to go out in public and duke it out with the likes of Superman, remember to remove your jammies first. It's not a good idea to go out in your sleepwear, especially if you also have a frilly mohawk and your nightie is pink. I don't even want to ask why you need kneepads in your sleeping suit, to each his own, but that "30th Century Chunky Farmboy in Overalls" look is just not gonna get it done, son. All those brains and still he can't put together a reasonable outfit. Makes you kind of appreciate Tyra Banks and the "Top Model" crew a little, you know? He looks like he’s having a screaming fit directed at the sky. Probably railing against whoever cut his hair like that (he seems to have long hair in the background picture to his left; maybe it was gone when he woke up). Pjs *are* appropriate attire for tantrums, right? Speaking of costumes, HM3 Alpha sure could use some boots and gloves. Working on the boots as we speak, Danny. Remember, it’s still just an alpha. @Jeff: Alpha one and one for all! I am shamed to say that I mis-identified his outfit as being “metrosexual.” However, my wife corrected me on this point. “Metrosexual is the kind of gay that women like. They’re straight enough to be attracted to women, but gay enough to dress really well. First, the scrolling list. Why not make it two rows? I think it would be easier to follow with the eye. Just split it into body parts and clothing items. Or, second, why not split the body parts into more definitive categories? “Male Standard” and “Male Military” don’t really stand out as descriptive, though I do recall this is an alpha and you might change it at any time. But still…why not click on “Body” and have it come up “Heads”, “Face”, “Torso”, “Arms”, “Legs”, “Hands / Feet”. On the same note, why differentiate items as “Right” and “Left”? If you have the Dupe and Flip buttons already, why have “Hand Right / Left”? Or “Shoulder”? Just saying, it might cut down on some of the programming and such. Third, perhaps there could be half-chests / stomachs and the like. I did something kind of cool the other day just screwing around, but I shrank the left shoulder pauldron horizontally a bit and made him look a little more like he was in the HM 2 position. Not perfectly, but it made me wonder if it could be improved on. Just throwing that one out there. I just really like helping. The old program has changed things for me in the way I do my writing and a host of other things besides. I want to see it become the greatest it can be so that everyone can feel the way I do when I crank it up and go to town. I addressed some of those issues in another thread, Damien. At this point it’s a little late to redo the navigation of items, we’re pretty much stuck with the way it is more or less. The short answer on the flipping issue is that it’s not intuitive enough for the casual user. I think an awful lot of people would not see the flipping and rotating stuff and would just assume there were not opposite items, and give up. I’m erring on the side of caution, like with the Tops where you’ve got one sleeve, the other sleeve, just the torso, and then the whole thing assembled all together, even though the latter can be manually created by putting them together yourself. …yeah, but ya gotta admit, it’s a *really* nice Jerry Ordway illustration. I loves me some Jerry Ordway. His early-90’s run on Superman was outstanding. Love me some Ordway, definitely. 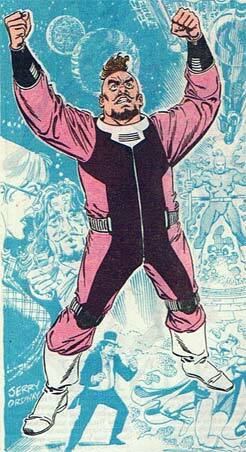 I thought (with no basis in reality at all) that this character was from the Byrne Superman era, but was it before that? The backstory on the Who’s Who entry was that he was a mentalist who gets taken over by the disembodied intellect of Viril Dox, a Coluan from the future. I assumed it was part of the initial Man of Steel retcon Byrne did, but now that I think about it, he had Brainiac as the Kryptonian super-computer didn’t he? This one isn’t awesone but not particulary ugly too. You’re hard, Jeff. I dunno, it all kinda blurs together. I have a vague recollection of the whole “disembodied intellect” thing, but I don’t think that was a Byrne idea. I think this was a reaching attempt on the part of the post-Byrne editors to “refresh” Brainiac. How you get “refreshed” as a dumpy middle-aged dude with a bad haircut, I don’t know. Mercifully, I don’t think it lasted long. He probably sleeps on the top bunk and has night terrors, hence the knee pads on his jammies. In answer to the final question posed in this entry, No, Jeff. No it doesn’t. He reminds me of a baby.